MLB sluggers from the Asia-Pacific will play a key role in this year’s playoffs. Major League Baseball’s regular season comes to a close on Sunday, and then the playoffs start in earnest. And this year, how a team’s Asia-Pacific players do likely will have profound effects on how far their teams advance. There are about two dozens Asia-Pacific players currently on Major League rosters, coming from Japan, South Korea, Taiwan and Australia. While some of them have spent most of the season in the minor leagues, there are several standouts who have been the top pitcher and players on their respective teams. Koji Uehara (pitcher, Boston Red Sox: 4-1, 1.12 ERA, 21 Sv) – After spending 10 seasons in Japan and then bouncing around three MLB teams, Uehara finally has been discovered as a gem. Pressed into service as the Red Sox’s closer mid-season, the Osaka native has simply been lights out, at one point racking up a 33 2/3-inning scoreless streak. His ability to close out games will be crucial to Boston’s hopes of winning a third World Series title in 10 years. 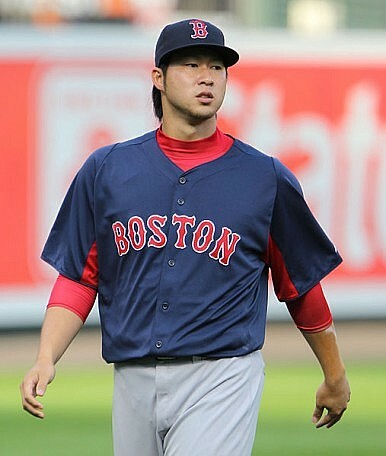 Junichi Tazawa (pitcher, Boston Red Sox: 5-3, 2.96 ERA) – Uehara’s bullpen mate is another MLB Japanese success story. Tazawa never played for the Nippon Professional Baseball league and signed with the Red Sox after a stint in the corporate league with Nippon Oil. After recovering from Tommy John elbow surgery in 2010, the Yokohama native has emerged as Boston’s setup man, a crucial cog in getting a 9th-inning lead into the hands of Uehara. Hyun-jin Ryu (pitcher, Los Angeles Dodgers: 14-7, 2.97 ERA, 2 CG) – The big left-hander (who actually does everything else right-handed) has become the important third wheel in the Dodgers’ rotation that features Cy Young winners Clayton Kershaw and Zack Greinke. L.A. paid a pretty penny for Ryu, spending $25 million to secure his passage from South Korea and then signing him to a 6-year, 36 million deal. He has delivered both on and off the field, succeeding Chan Ho Park as the favorite of Southern California’s baseball-mad Korean community. Shin-Soo Choo (outfielder, Cincinnati Reds: .287 Avg,, 21 HR, 54 RBI, .891 OPS) – The only position player on this list, Choo also began his career as a pitcher in Korea but converted to the outfield after signing an MLB deal in 2005. Traded from the Cleveland Indians in the offseason, Choo has been a rock solid presence for the Reds in 2013, sending them into the playoffs Monday night with a walk-off shot off the outfield wall. Grant Balfour (pitcher, Oakland Athletics: 1-3, 2.67 ERA, 38 Sv) – Since emerging as the closer late last season, Balfour has become the bullpen anchor the A’s have been searching for since Oakland traded All-Star closer Andrew Bailey to Boston in 2011. Balfour is easily the headliner among half a dozen Aussie players currently in the majors, as the Sydney native became the first pitcher from Down Under to play in the All-Star Game this season. Yu Darvish (pitcher, Texas Rangers: 13-9, 2.82 ERA) – The former Nippon Ham Fighters ace and Pacific League MVP came to the U.S. with much fanfare, with the Rangers paying a reported $51 million posting fee to acquire his rights. After a promising first season in 2012, Darvish is now firmly entrenched as the Rangers’ staff ace, after having been named to the All-Star Game for a second consecutive year. Darvish might have to carry Texas into the playoffs, as he’s scheduled to start the potential do-or-die season finale Sunday. Travis Blackley (pitcher, Texas Rangers, 2-2, 4.83 ERA) – Blackley was traded from the Houston Astros in August as the Rangers needed more bullpen arms for the stretch drive. The Melbourne native, first signed by the Seattle Mariners in 2000, is hoping to find himself a permanent role after bouncing between the majors and minors for five franchises. Samuel Chi is the Editor of RealClearSports and RealClearWorld. His column on world sport appears every Thursday in The Diplomat. A look at the biggest Asian names in world sport today.